SOUTHAMPTON, N.Y. (AP) Somehow, tying a U.S. Open record with a final-round 63 wasn’t totally satisfying for Tommy Fleetwood. The Englishman nearly got it: A birdie putt from 8 feet on No. 18 broke right and skidded past the hole. Still, the 12th-ranked player in the world had a special achievement on Sunday. Only five players have shot 63 in the U.S. Open, and only Johnny Miller in 1963 – when he won the tournament – had done it in the fourth round. So Fleetwood knew what that last stroke was all about. ”The putt, I actually started it on the line I wanted to,” he said. ”It was a little bit slower than I expected. After he missed, one fan yelled out: ”You still have beautiful hair!” referring to Fleetwood’s long locks. With Shinnecock Hills playing far easier Sunday than in a brutal third round when the USGA conceded the course was at points unfair, Fleetwood had eight birdies and one bogey. He finished at 2 over and wound up one shot behind repeat winner Brooks Koepka. ”When you finish, you always feel like you’re going to be a bit short, but we’ll see,” Fleetwood said after finishing long before Koepka. 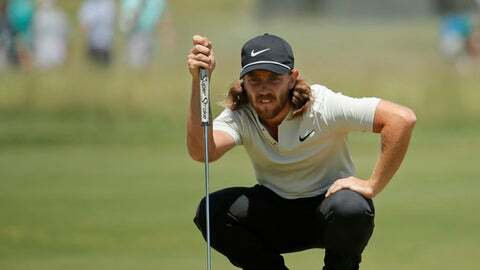 A winner of four tournaments on the European Tour and in his first season as a PGA Tour member, Fleetwood has done well in the U.S. Open, finishing 27th in 2015 and fourth last year. He tied for 17th at the Masters in April and then was seventh at The Players Championship. So his resume is solid. And almost had a 62 on it. ”I had chances the last few holes to shoot 61 or 62,” he admitted, knowing the record in a major is Branden Grace’s 62 at last year’s British Open. The others with a 63 at the U.S. Open are Jack Nicklaus and Tom Weiskopf in the first round in 1980 at Baltusrol; Vijay Singh in the second round in 2003 at Olympia Fields; and Justin Thomas last year in the third round at Erin Hills. Fleetwood is the fifth player to shoot 63 in the final round of a major and not win. He joins Jodie Mudd in the 1991 British Open and Li Haotong in the 2017 British Open, both at Royal Birkdale; Payne Stewart at the 1993 British Open at Royal St. George; and Brad Faxon at the 1995 PGA Championship at Riviera. Fleetwood hit 13 of 14 fairways and 16 of 18 greens in regulation. He nailed putts as long as 57 feet on No. 2 – a great way to get started – and nearly 30 feet on the 15th for his final birdie. On 14, he putted from just short of the green and knocked in a 21-footer. Overall, it was a brilliant display of shot-making and putting by the 27-year-old from Southport, England, who this year successfully defended his title in Abu Dhabi. All Fleetwood could do after finishing was enjoy his first Father’s Day and watch his peers tackle the back nine at a somewhat benign Shinnecock. He spent it with his son, Frankie, and wife Clare.